Lena Pillars were formed in some of the Cambrian Period sea-basins. 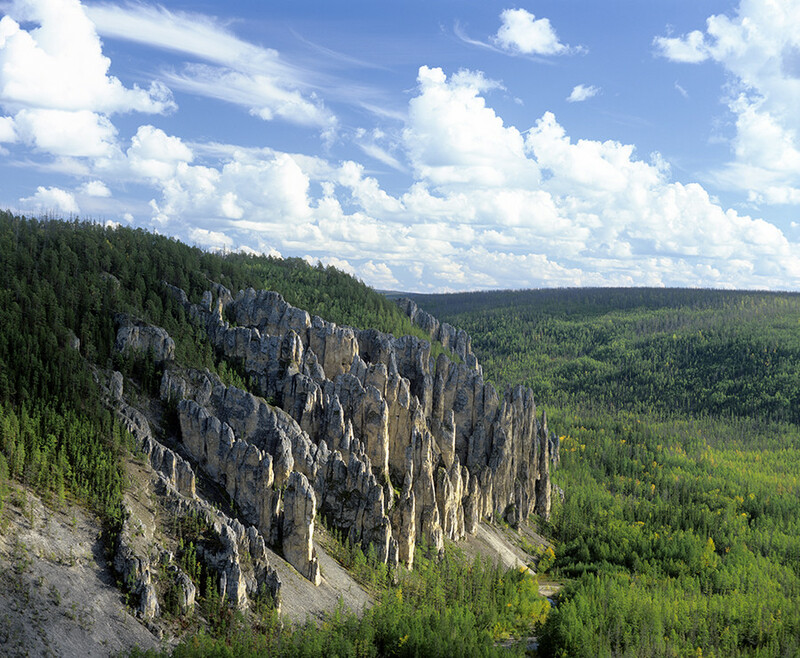 The Lena Pillars National Park in Yakutia has a surreal and majestic landscape that has to be seen to be believed. The internal republic of Yakutia, which has a total area of 3,083.523 square kilometres is just slightly smaller than India. Its hallmark is rightly considered to be the famous Lena Pillars, which were included in the 2012 UNESCO Natural Heritage list. 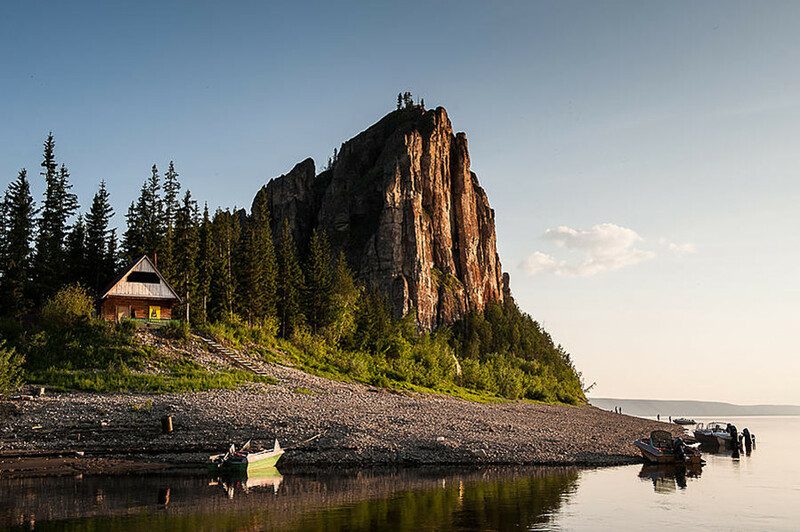 One way of reaching Lena Pillars is to first travel to the small city of Pokrovsky, Hangalaskiy ulus, and from there take a ride on a boat or motorboat to the Natural Park. The coachman’s tract was laid along these lands, most likely since the foundation of Yakutsk. Today, this tract resembles the ruins of several houses and a cemetery where the dead were buried during the transitions. Some of the inscriptions on the stones can be found today. They say that the coachmen’s descendants still live in some of the villages, and they can be very easily recognized: they don’t resemble the Yakuts much, and they have blue eyes. The Lena River is huge. You can travel on it without catching sight of the opposite shore, and if it is visible, it does not mean that it is the shore. There are several islands on the river, some of them are so big that they have developed their own, unique microclimate. Therefore, on some islands there are real deserts. Local Yakuts call them Tukulans, which translated from the Evenk language (Tukulan) means "sands." After an obstacle course through the swampy shores, an ascent begins, with the first sand already visible from the top. One can see the desert stalking over the forest, burying more and more trees, leaving behind only the blackened and withered trunks. If it were not for the forest on the horizon, it could be said that you are in the real Sahara desert – the sun burns all living things mercilessly, with only small bushes and flowers still clinging to the surface. 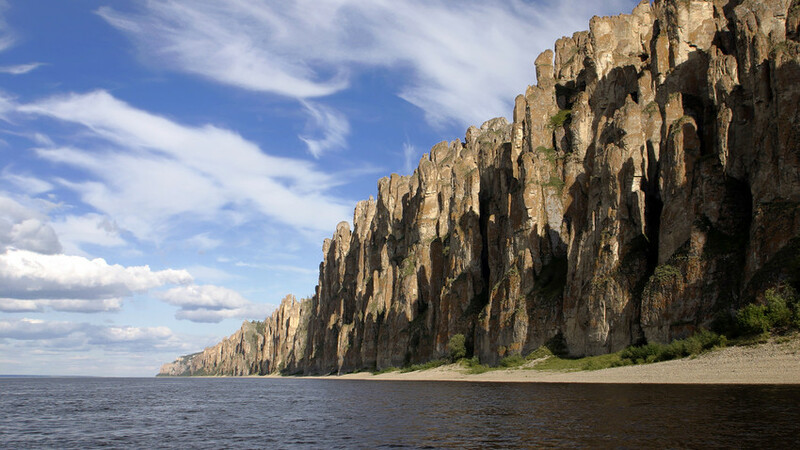 After a stop at the Yakut deserts, you can go down the Lena River to the Lena Pillars themselves. On both river banks small rocks start to appear. Then they line up into a solid wall, and this wall of weathered residual outcrops stretches up to the horizon line. After half an hour of travelling, the Lena Pillars, finally appear in all their glory. Cliffs of red sandstone, sometimes covered in forests, are reflected in the river’s smooth surface. Cliffs of pale grey limestone hang over the water and layers of quartzite glisten in the sun. You cannot climb all of the rocks, but there are a few scenic viewpoints in the Reserve at an altitude of about 100 meters. From here you can admire the surroundings and the great Siberian river. Lena Pillars are cliffs of red sandstone, sometimes covered in forests. The reserve offers its visitors one and two-day trips in Russian and in English that allow them to admire the unique terrain, familiarize themselves with the local vegetation and listen to the story about the fauna that has been living there for a long time. The climate in the area of the pillars is usual for these places; it is a contrasting one (sharply continental, that is). In winter the mercury can drop below -35 ° C and in summer it is possible to expect not only +20 ° C, but also +40 ° C can be usual for this place. The river makes the air very humid, causing hard frost in winter, and swelteringly hot days in summer. The road to the Lena Pillars is tiring but enjoyable. One can travel by plane from Moscow to Yakutsk by plane at the price of about 8-10 thousand rubles, The duration of the flight is roughly 7 hours. From Yakutsk to Lena Pillars there are boats running giving tourists a chance to see the fascinating beauty of the area. You can make the journey on a small motor boat for 350 rubles per person, or you can hire a private boat: during peak season it will cost 4000 rubles per hour. More information is available on the National Park’s official site (in English). Acommodation and tour timetable to the Lena Pillars by the official carrier Visit Yakutia (in English) can be found here .